0.236" (6mm) OD x 0.079" (2mm) ID x 0.787" (20mm) long, N50 Rare Earth Neodymium Tube Magnet, Magnetized through the length. Nickel Plated. 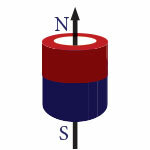 About Small Tube Magnets: Defined with an outside diameter (OD) equal to or less than 0.250” (6.35mm). The outer diameter (OD), inner diameter (ID), and length will determine the reach and profile of the magnetic field and performance of the tube magnets. Custom Magnets: Need custom Tube Magnets? Use one of the below methods to contact a magnetics specialist about your application.